Russo Jewish historian; born at Mstis. lavl, government of Mohilev, 1860. He attended the Jewish government school of his native town, and then the district school, whence he was graduated in 1877. In search of knowledge and the means of support, Dubnow moved from place to place, visiting Wilna, Dünaburg, Mohilev, and Smolensk. He earned his livelihood by tutoring, and at the same time prepared himself for university work. In 1880 he settled in St. Petersburg, where he soon became a contributor to the "Russki Yevrei," publishing his first article on the historical development of Jewish thought under the title "Glavnyye Momenty iz Istorii Yevreiskoi Mysli." About this time (1881) he also assumed charge of the foreign news department of the Russo-Jewish periodical "Razsvyet." 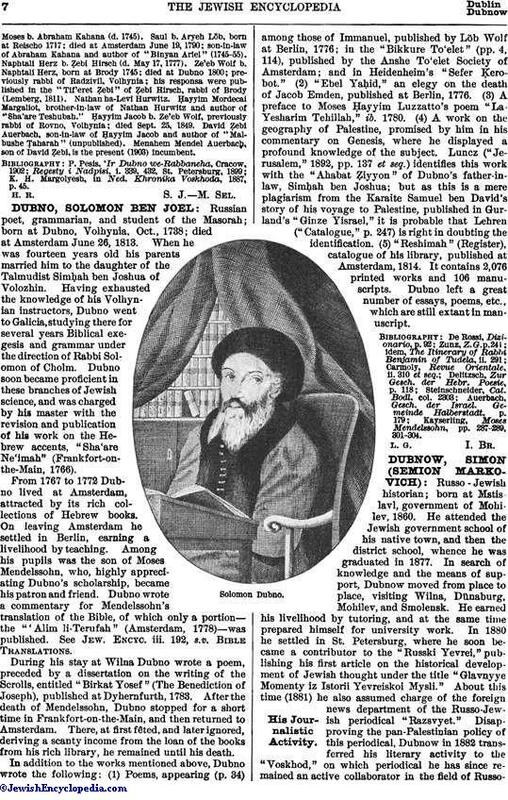 Disapproving the pan-Palestinian policy of this periodical, Dubnow in 1882 transferred his literary activity to the "Voskhod," on which periodical he has since remained an active collaborator in the field of Russo-Jewishhistory and Russian Judaism in general. Among the more important of his early contributions are his articles on Shabbethai Ẓebi, under the title "Sabbatai Zewi i Pseudomessianizm v XVII. Vyekye" (in "Voskhod," 1883, Nos. 9-12), and on the Frankists, entitled "Frank i Yevo Sekta Christianstvuyushchikh" (ib. 1883, Nos. 1-10). In 1883 he assumed charge of the critical department of the "Voskhod." He also wrote an essay on reform in the Jewish religion, entitled "Kakaya Samoemancipatziya Nuzhna Yevreyam" (ib. 1883, Nos. 5-8), which created a stir in Orthodox circles. Among his other valuable contributions on the Jewish question may be numbered his articles on the civic condition of the Jews and on the reform of Jewish school education in Russia, and his critical reviews in "Voskhod," 1885 to 1887. Another important work of Dubnow's is his monograph on the history of Ḥasidism ("Istoriya Chassidizma," in "Voskhod," 1888-93). This work is based on the study of original and hitherto unexploited sources. In 1891 Dubnow set himself to the task of creating among the Russian Jews an interest in their history. For this purpose he published a series of articles in "Voskhod," outlining a plan for the study of the history of the Jews in Russia, and advocating the establishment of a Russo-Jewish historical society. These articles were afterward printed in book form under the title "Ob Izuchenii Istorii Russkikh Yevreyev," St. Petersburg, 1891. Although the appeal made by Dubnow did not create such a widespread interest as he had anticipated, his efforts were seconded by many persons interested in the history of the Jews in Russia. From the many unpublished documents gathered by Dubnow from libraries and from the "pinḳeses" of Jewish communities, he prepared, a series of contributions bearing the title "Istoricheskiya Soobscheniya" (in "Voskhod," 1893-95). Among Dubnow's other historical studies may be mentioned his articles on the part taken by Jews in the French Revolution (in "Voskhod," 1889) and on the Jewish historian Grätz (ib. 1892, Nos. 2-9). In 1893 he published (in "Voskhod," pp. 9-12) a philosophic-historical study, "Chto Takoe Yevreiskaya Istoria"; a German translation by I. F. [Friedländer] appeared in Berlin, 1898, and an English translation was published by the Jewish Publication Society of America in 1903. 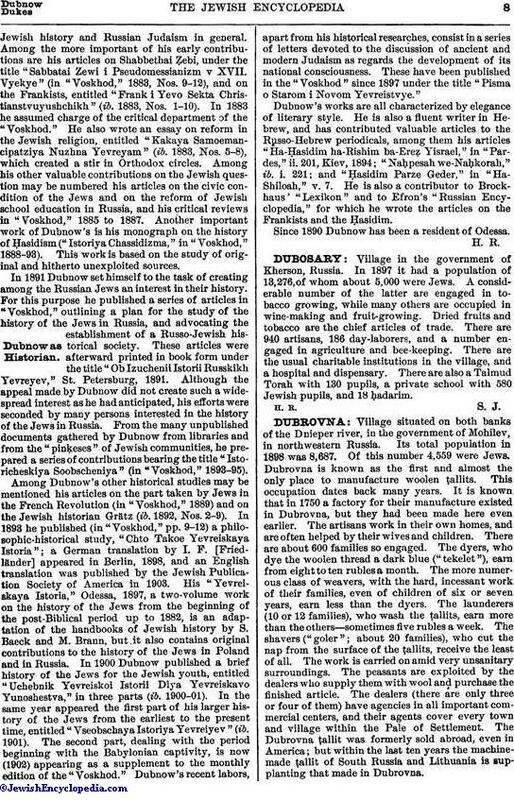 His "Yevreiskaya Istoria," Odessa, 1897, a two-volume work on the history of the Jews from the beginning of the post-Biblical period up to 1882, is an adaptation of the handbooks of Jewish history by S. Baeck and M. Brann, but it also contains original contributions to the history of the Jews in Poland and in Russia. In 1900 Dubnow published a brief history of the Jews for the Jewish youth, entitled "Uchebnik Yevreiskoi Istorii Dlya Yevreiskavo Yunoshestva," in three parts (ib. 1900-01). In the same year appeared the first part of his larger history of the Jews from the earliest to the present time, entitled "Vseobschaya Istoriya Yevreiyev" (ib. 1901). The second part, dealing with the period beginning with the Babylonian captivity, is now (1902) appearing as a supplement to the monthly edition of the "Voskhod." Dubnow's recent labors, apart from his historical researches, consist in a series of letters devoted to the discussion of ancient and modern Judaism as regards the development of its national consciousness. These have been published in the "Voskhod" since 1897 under the title "Pisma o Starom i Novom Yevreistvye." Dubnow's works are all characterized by elegance of literary style. 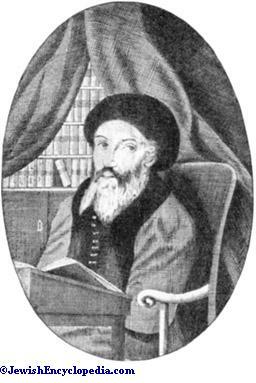 He is also a fluent writer in Hebrew, and has contributed valuable articles to the Russo-Hebrew periodicals, among them his articles "Ha-Ḥasidim ha-Rishim ba-Ereẓ Yisrael," in "Pardes," ii. 201, Kiev, 1894; "Naḥpesah we-Naḥkorah," ib. i. 221; and "Ḥasidim Parze Geder," in "Ha-Shiloah," v. 7. He is also a contributor to Brockhaus' "Lexikon" and to Efron's "Russian Encyclopedia," for which he wrote the articles on the Frankists and the Ḥasidim. Since 1890 Dubnow has been a resident of Odessa.